Last month we took the kids on a missions trip to Puerto Rico for spring break. Of course, when you know you have a beach trip coming up it is easy to stay on track with healthy eating and exercise. Then you come home and eat all the sweets for a month because there is no more beach in your near future. There is nothing like trying on shorts to stop you in your dessert eating tracks quickly. Shorts that fit just fine last month are now feeling snug. Curse you sweet tooth! Or should I say sweet teeth because I’m sure this problem isn’t from just one tooth. LOL! That was my dilemma earlier this week. I know, right? First world problems right here. Right away I busted out the healthy eating and made this strawberry orange spinach salad. It’s one of my favorite dinners when I want to get back on track quickly! 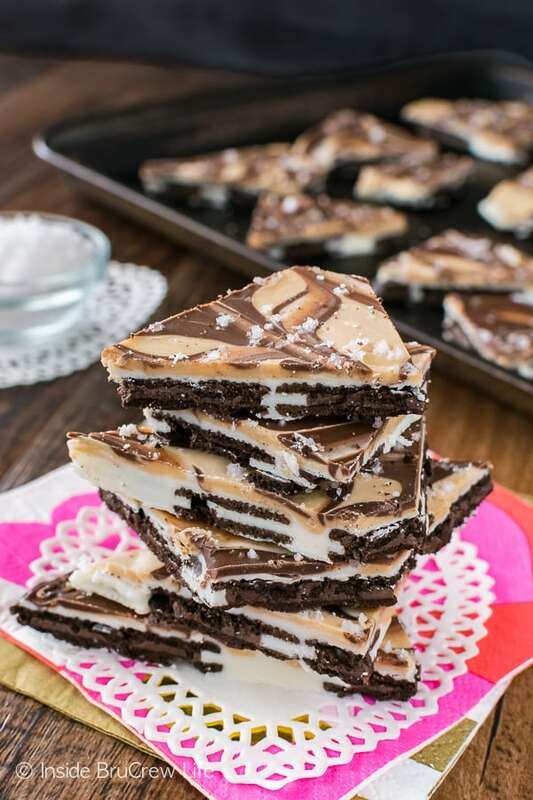 Of course, now that I’m trying to eat healthier and watch those empty calories, I can’t stop thinking about this sweet bark. 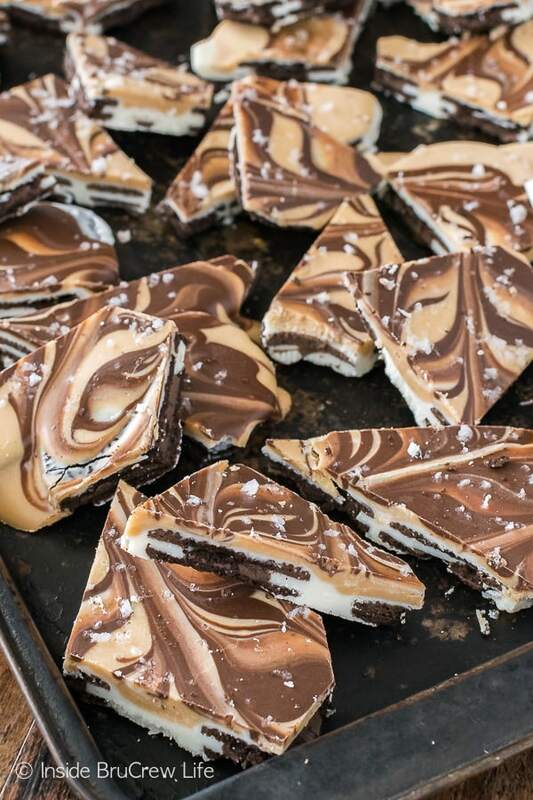 A few years ago I made this easy peppermint Oreo bark for the holidays. It was a hit with everyone that got a piece. 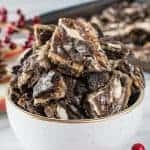 Obviously, it’s not the holidays, so I had to give that bark a fun twist that would work for all year long. 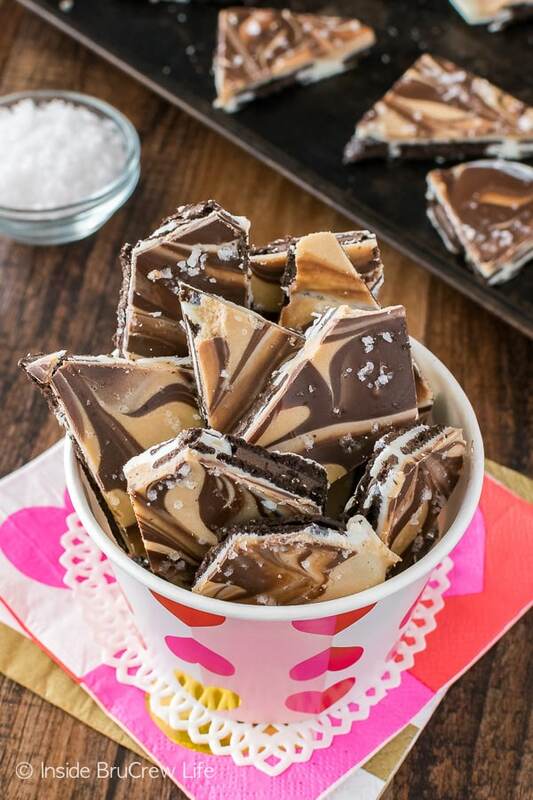 Enter in the salted caramel chips that have been sitting in my cupboards calling my name. I’m pretty sure eating one bag a handful at a time was part of the reason for those snug shorts. Time to get those chips out of my pantry. The first thing you want to do is to line a pan with foil. This makes it so much easier to get the chocolate and cookies off later. 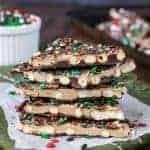 Then put a tiny dab of white chocolate on the back of each cookie and place them on the foil lined pan right next to each other in a grid-like pattern. This just keeps the cookies from moving around later when you are trying to smooth chocolate all over them. Trust me on this one. 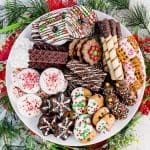 After you have all the cookies “glued” down, let them chill for a few minutes. Then heat your white chocolate just a little bit more and pour over the tops of the cookies. Spread it all out with an angled spatula quickly. The chocolate will go down into the cracks of the cookies and hold them all together. Let that set just a little bit. Then melt the salted caramel chips and chocolate melts. It’s time to work quickly because your chocolate will set up quickly. 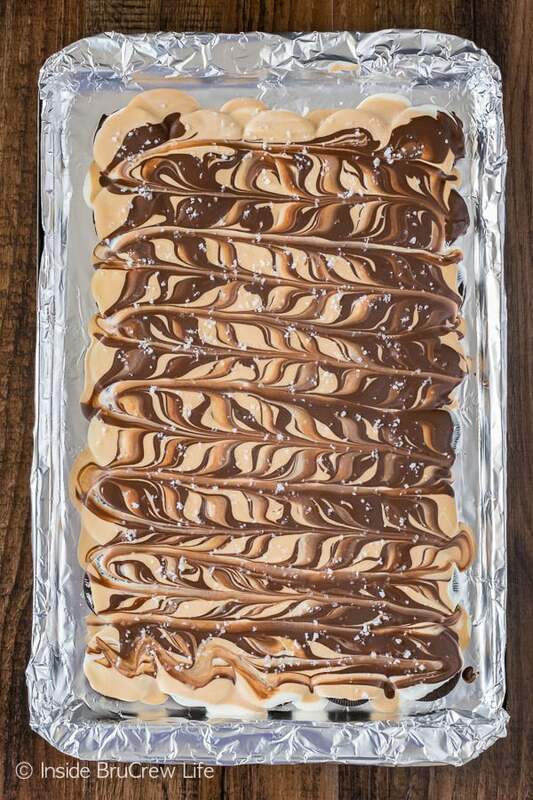 Pour the salted caramel over the top of the white chocolate and spread it out gently. Right away drop spoonfuls of the melted chocolate on top. Use a knife to swirl them together. Just don’t over swirl, or it will start to get muddy looking. A sprinkling of sea salt finishes it all off. Be sure to use COARSE ground salt. Big chunks are what we are looking for here. 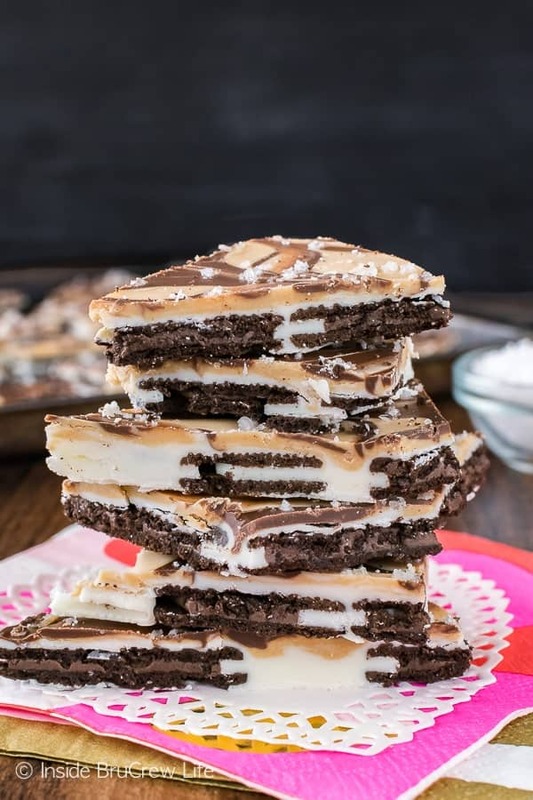 If it is fine, you are going to add too much and ruin the whole pan of salted caramel Oreo bark. Now the snug shorts might like that idea, but trust your sweet tooth and don’t do it!!! 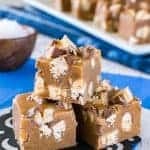 If you are a fan of salted caramel like me, you have got to make these Salted Caramel Truffles and this Salted Caramel Mocha Fudge. Then wash it all down with a big glass of Salted Caramel Iced Coffee. Yummo!!!! Place the white chocolate melts in a bowl and melt according to the package directions. 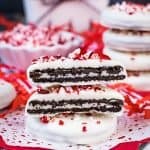 Spread a little bit of white chocolate on the back of each Oreo thin and place them on the prepared pan. Refrigerate for 5 minutes. Heat the white chocolate for 15-20 seconds and stir. Spoon the white chocolate all over the cookies on the tray and spread out with a spatula. Let set slightly. Place the salted caramel chips and shortening in another bowl and heat for 30 seconds. Stir until melted and creamy. Heat an additional 15 seconds at a time, if needed. Place the chocolate melts in a bowl and melt according to the package directions. Pour the caramel on top of the white chocolate and spread it over the top gently. 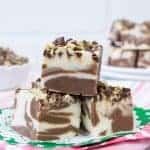 Drop the chocolate on top of the caramel layer by spoonfuls and drag a knife gently through it to give it a swirled look. Sprinkle with coarse sea salt while it is still wet. Let set. Break or cut into chunks and store in a sealed bag. Where do you buy salted caramel chips? Brand? Can you substitute melted caramel? I bought the salted caramel chips at Walmart in the baking aisle. I believe there are two brands that sell this kind. I haven’t tried using melted caramel in this bark. I believe it would work, but it would definitely give it a different texture and taste.